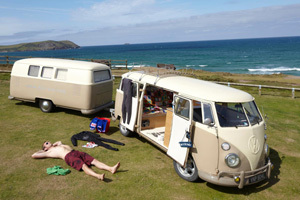 Dub Box is a range of retro, two-berth caravans that merge the best in cool with the convenience of comfortable camping. 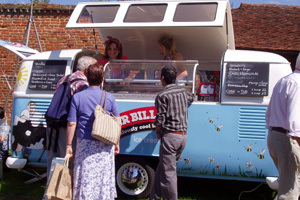 Enjoy the camper kudos without having restoration or upkeep costs. A glass-fibre body that will never rust, have no extra MOT or taxes. All our caravans can give you a new view every day, from family weeks on a beach to a weekend festival crash pad or the calm serenity of the British countryside for just the two of you. 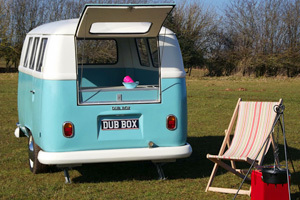 Lovingly handcrafted in leafy Herefordshire, every Dub Box is created uniquely for its new owner. The glass-fibre body shell will be coloured to your choice. Pick from modern or retro paint codes to complement your internal finish and fabrics. The range of choice in flooring, upholstery, cupboards and even worktops ensures each Dub Box is as individual as their owners.The Dub Box is designed to ensure it is not overwhelming or daunting to tow. It is a smooth, lightweight and complementary addition to your journey. You choose the colour, fabrics, laminates, flooring etc. Packed with features, including sink, fridge, LED lights, etc.